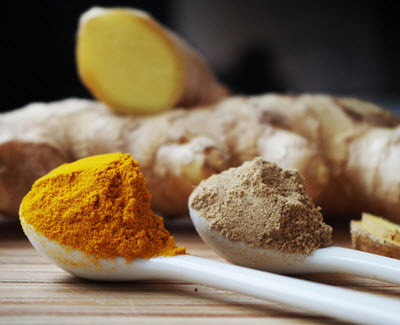 Ginger (Zingiber officinale) is a perennial plant belonging to the same family as Turmeric (Curcuma longa) and Cardamom (Elettaria cardamomum), two plants that just like ginger are both culinary favourites and included in a lot of folk remedies and modern diet supplements. The use of ginger in ancient medicine is not limited to its native range in Asia. As early as the first century AD, dried powdered ginger roots were exported on the Silk Road network all the way to Europe. The ginger plant can reach a height of about one meter and produces yellow flowers. It’s native to South Asia where it grows in tropical rainforests. The largest genetic diversity for ginger is found on the Indian subcontinent. When ginger is included in folk medicine, dietary supplements and for culinary purposes, it is almost always the underground rhizome that it used. In many recipes it is simply referred to as ginger, but the term ginger-root also exist. The rhizome is a modified subterranean stem with a great capacity for storing starch, protein and various nutrients that the plant can use later. The ginger plant can also spread by sending out shoots from the nodes on the rhizome. For many centuries, this was the ginger preparation most likely to reach Europe. Ginger powder is a spice made from rhizomes that have been peeled, sliced and cooked before pounded into a powder. Some ginger powders are made from rhizomes cooked in heavy sugar syrup. Nowadays, many stores and food markets sell whole ginger rhizome. This gives a great fresh taste, but is more impractical to store than the powder. This is a common candy in health-food stores and East Asian food markets. It’s made by cooking ginger rhizomes in a sweet syrup, air-drying them and then rolling them in sugar crystals. This Asian favourite is traditionally made by slicing the rhizome into thin slices before placing it in the pickle liquid. In Japan, a type of pickled ginger called gari is made by marinating young tender rhizomes in a solution of sugar and vinegar. Gari is typically eaten to cleanse the palate between different pieces of sushi, and before and after the meal. The volatile oils primarily responsible for the characteristic ginger fragrance and flavour are zingerone, shogaols and gingerols. -gingerol, the dominating pungent compound in the rhizome is a fairly close relative of the piperine found in black pepper and the capsaicin in chilli pepper. -gingerol is currently being researched as a possible treatment option for certain types of cancer, since some cancer cell types die when exposed to -gingerol. Significantly more research is needed before it will be possible to tell if treatment with -gingerol would be helpful for patients suffering from these cancer types. Why is cooked ginger so sweet compared to raw ginger? Because when -gingerol is heated up, it transforms into zingerone and -shogaol, and zingerone has a sweet taste. The same happens when -gingerol is dried. Zingerone can stimulate the release of catecholamines the aids in the breakdown of fat cells. Shogaol is known for its antitussive (anti-cough) capacity, and many folk remedies against dry cough includes ginger. For more information about Shogaol and blood pressure, see https://www.ncbi.nlm.nih.gov/pubmed/6335723. For more information about -shogaol and dementia, see https://www.ncbi.nlm.nih.gov/pubmed/24796668. Ginger can interact with certain drugs, including the anticoagulant drug warfarin and the cardiovascular drug nifedipine.